For the use of the term in psychiatry, see Derailment (thought disorder). Railroad wrecks in the 19th century were sensational, and the newspapers claimed them to be due to human failure or the consequence of corporate greed. It took railroads several decades to improve train-control practices and adopt safety devices sufficient to make railroad travel truly safe. Very few passengers were killed in train wrecks in the US before 1853. The early trains ran slowly and made short trips, night travel was rare, and there were not many of them in operation. While trains were convenient for travel and for transporting goods, they had become a greater danger over the years as their speed had increased. While fatal railway accidents occurred about once a year previously, there was a sudden 800 percent increase in accidents in 1853. Some railroad accidents were caused by human error, but other causes included derailment, explosions on board, equipment failures, and bridge collapses. Thereafter, the rate of accidents returned to its former level. Boiler explosions had been noted in locomotive-type fire tube boilers when the top of the firebox (called the crown sheet) failed. This had to be covered with a significant layer of water at all times or the heat of the fire would weaken it to the point of failure, even at normal working pressures. Low water levels in the boiler when traversing a significant grade could expose parts of the crown sheet. Even a well-maintained firebox could fail explosively if the water level in the boiler was allowed to fall far enough to leave the top plate of the firebox uncovered. Due to the constant expansion and contraction of the firebox a form of "stress corrosion" could also take place at the ends of the firebox plates. This corrosion was accelerated by poor water quality and the build-up of boiler scale. A fuel explosion within the confines of the firebox (actually the ignition of unburned gases caused by an inappropriate air/fuel mixture) could also damage the pressurized boiler tubes and interior shell, potentially triggering a structural failure. The majority of locomotive explosions were found to be related to these circumstances, and constant attention to the engine was found to be the best defense against catastrophe. On 6 January 1853, the Boston & Maine express, traveling from Boston to Lawrence, MA, derailed at forty miles an hour when an axle broke, and the single coach went down an embankment breaking in two. Only one person was killed, the eleven-year-old son of President-elect Franklin Pierce, who was also on board but was only badly bruised. A few days later, on 23 January 1853, at Glen Rock, PA, the conductor B.A. Stells was lost after the caboose was detached from its train cars in a forest during a blizzard. The body of the man and the car were not found until Spring. On 6 May 1853, a New Haven Railroad train ran through an open drawbridge at Norwalk, CT and plunged into the Norwalk River. Forty-six passengers were crushed to death or drowned. This was the first major railroad drawbridge accident. On 17 July 1856, at Fort Washington, PA, there was one of the most infamous train wrecks to ever occur in the US and the deadliest in the world up to that time. Known as the Great Train Wreck, two North Pennsylvania Railroad trains, one of them carrying 1,500 Sunday School children to a picnic, collided. Upon impact, the boiler of the passenger train exploded and the train carrying the children derailed. Fifty-nine people were instantly killed, and dozens more died from their injuries. The conductor of the passenger train committed suicide the same day, although he was later absolved of any responsibility. Finally in this sampling, on 11 May 1858, at Utica, NY, two New York Central trains, a westbound freight and the eastbound Cincinnati Express, passed on parallel tracks on a forty-foot wooden trestle over Sauquoit Creek. It collapsed under their combined weight, utterly destroying the passenger train, killing nine and injuring 55 persons. During the 19th century derailments were commonplace, but progressively improved safety measures have resulted in a stable lower level of such incidents. 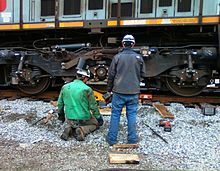 In the US, derailments have dropped dramatically since 1980 from over 3,000 annually (1980) to 1,000 or so in 1986, to about 500 in 2010.
train handling (snatches due to sudden traction or braking forces, referred to as slack action in North America). A traditional track structure consists of two rails, fixed at a designated distance apart (known as the track gauge), and supported on transverse sleepers (ties). Some advanced track structures support the rails on a concrete or asphalt slab. The running surface of the rails is required to be practically continuous and of the proper geometrical layout. In the event of a broken or cracked rail, the rail running surface may be disrupted if a piece has fallen out, or become lodged in an incorrect location, or if a large gap between the remaining rail sections arises. 170 broken (not cracked) rails were reported on Network Rail in the UK in 2008, down from a peak of 988 in 1998/1999. In jointed track, rails are usually connected with bolted fishplates (joint bars). The web of the rail experiences large shear forces and these are enhanced around the bolt hole. Where track maintenance is poor, metallurgical fatigue can result in the propagation of star cracking from the bolthole. In extreme situations this can lead to a triangular piece of rail at the joint becoming detached. Metallurgical changes take place due to the phenomenon of gauge corner cracking (in which fatigue microcracking propagates faster than ordinary wear), and also due to the effects of hydrogen inclusion during the manufacturing process, leading to crack propagation under fatigue loading. 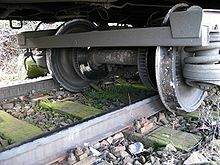 Local embrittlement of the parent metal may take place due to wheel spin (traction units rotating driving wheels without movement along the track). Rail welds (where rail sections are joined by welding) may fail due to poor workmanship; this may be triggered by extremely cold weather or improper stressing of continuously welded rails, such that high tensile forces are generated in the rails. The fishplates (joint bars) in jointed track may fail, allowing the rails to pull apart in extremely cold weather; this is usually associated with uncorrected rail creep. Derailment may take place due to excessive gauge widening (sometimes known as road spread), in which the sleepers or other fastenings fail to maintain the proper gauge. In lightly engineered track where rails are spiked (dogged) to timber sleepers, spike hold failure may result in rotation outwards of a rail, usually under the aggravating action of crabbing of bogies (trucks) on curves. The mechanism of gauge widening is usually gradual and relatively slow, but if it is undetected, the final failure often takes place under the effect of some additional factor, such as excess speed, poorly maintained running gear on a vehicle, misalignment of rails, and extreme traction effects (such as high propelling forces). The crabbing effect referred to above is more marked in dry conditions, when the coefficient of friction at the wheel to rail interface is high. The running gear — wheelsets, bogies (trucks), and suspension — may fail. The most common historical failure mode is collapse of plain bearings due to deficient lubrication, and failure of leaf springs; wheel tyres are also prone to failure due to metallurgical crack propagation. Modern technologies have reduced the incidence of these failures considerably, both by design (specially the elimination of plain bearings) and intervention (non-destructive testing in service). If a vertical, lateral, or crosslevel irregularity is cyclic and takes place at a wavelength corresponding to the natural frequency of certain vehicles traversing the route section, there is a risk of resonant harmonic oscillation in the vehicles, leading to extreme improper movement and possibly derailment. This is most hazardous when a cyclic roll is set up by crosslevel variations, but vertical cyclical errors also can result in vehicles lifting off the track; this is especially the case when the vehicles are in the tare (empty) condition, and if the suspension is not designed to have appropriate characteristics. The last condition applies if the suspension springing has a stiffness optimised for the loaded condition, or for a compromise loading condition, so that it is too stiff in the tare situation. The vehicle wheelsets become momentarily unloaded vertically so that the guidance required from the flanges or wheel tread contact is inadequate. Junctions and other changes of routing on railways are generally made by means of points (switches — movable sections capable of changing the onward route of vehicles). In the early days of railways these were moved independently by local staff. Accidents — usually collisions — took place when staff forgot which route the points were set for, or overlooked the approach of a train on a conflicting route. If the points were not correctly set for either route — set in mid-stroke — it is possible for a train passing to derail. The first concentration of levers for signals and points brought together for operation was at Bricklayer's Arms Junction in south-east London in the period 1843-1844. The signal control location (forerunner of the signalbox) was enhanced by the provision of interlocking (preventing a clear signal being set for a route that was not available) in 1856. To prevent the unintended movement of freight vehicles from sidings to running lines, and other analogous improper movements, trap points and derails are provided at the exit from the sidings. In some cases these are provided at the convergence of running lines. It occasionally happens that a driver incorrectly believes s/he has authority to proceed over the trap points, or that the signaller improperly gives such permission; this results in derailment. 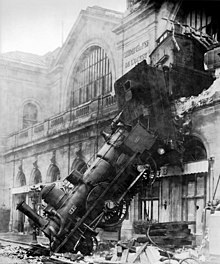 The resulting derailment does not always fully protect the other line: a trap point derailment at speed may well result in considerable damage and obstruction, and even a single vehicle may obstruct the clear line. If a train collides with a massive object, it is clear that derailment of the proper running of vehicle wheels on the track may take place. Although very large obstructions are imagined, it has been known for a cow straying on to the line to derail a passenger train at speed such as occurred in the Polmont rail accident. The most common obstructions encountered are road vehicles at level crossings (grade crossings); malicious persons sometimes place materials on the rails, and in some cases relatively small objects cause a derailment by guiding one wheel over the rail (rather than by gross collision). Derailment has also been brought about in situations of war or other conflict, such as during hostility by Native Americans, and more especially during periods when military personnel and materiel was being moved by rail. The handling of a train can also cause derailments. The vehicles of a train are connected by couplings; in the early days[when?] of railways these were short lengths of chain ("loose couplings") that connected adjacent vehicles with considerable slack. Even with later improvements there may be a considerable slack between the traction situation (power unit pulling the couplings tight), and power unit braking (locomotive applying brakes and compressing buffers throughout the train). This results in coupling surge. More sophisticated technologies in use nowadays generally employ couplings that have no loose slack, although there is elastic movement at the couplings; continuous braking is provided, so that every vehicle on the train has brakes controlled by the driver. Generally this uses compressed air as a control medium, and there is a measurable time lag as the signal (to apply or release brakes) propagates along the train. If a train driver applies the train brakes suddenly and severely, the front part of the train is subject to braking forces first. (Where only the locomotive has braking, this effect is obviously more extreme). The rear part of the train may overrun the front part, and in cases where coupling condition is imperfect, the resultant sudden closing up (an effect referred to as a "run-in") may result in a vehicle in tare condition (an empty freight vehicle) being lifted momentarily, and leaving the track. This effect was relatively common in the nineteenth century. On curved sections, the longitudinal (traction or braking) forces between vehicles have a component inward or outward respectively on the curve. In extreme situations these lateral forces may be enough to encourage derailment. A special case of train handling problems is overspeed on sharp curves. This generally arises when a driver fails to slow the train for a sharp curved section in a route that otherwise has higher speed conditions. In the extreme this results in the train entering a curve at a speed at which it cannot negotiate the curve, and gross derailment takes place. It takes roughly 6.976 × 106 N to completely derail a train traveling at such circumstances. The specific mechanism of this may involve bodily tipping (rotation) but is likely to involve disruption of the track structure and derailment as the primary failure event, followed by overturning. An example of speeding on a curve would be the May 2015 Philadelphia train derailment involving an Amtrak train traveling at 106 mph (171 km/h), twice the maximum allowable speed of 50 mph (80 km/h). The guidance system of practical railway vehicles relies on the steering effect of the conicity of the wheel treads on moderate curves (down to a radius of about 500 m, or about 1,500 feet). On sharper curves flange contact takes place, and the guiding effect of the flange relies on a vertical force (the vehicle weight). A flange climbing derailment can result if the relationship between these forces, L/V, is excessive. The lateral force L results not only from centrifugal effects, but a large component is from the crabbing of a wheelset which has a non-zero angle of attack during running with flange contact. The L/V excess can result from wheel unloading, or from improper rail or wheel tread profiles. The physics of this is more fully described below, in the section wheel-rail interaction. Wheel unloading can be caused by twist in the track. This can arise if the cant (crosslevel, or superelevation) of the track varies considerably over the wheelbase of a vehicle, and the vehicle suspension is very stiff in torsion. In the quasi-static situation it may arise in extreme cases of poor load distribution, or on extreme cant at low speed. If a rail has been subject to extreme sidewear, or a wheel flange has been worn to an improper angle, it is possible for the L/V ratio to exceed the value that the flange angle can resist. If weld repair of side-worn switches is undertaken, it is possible for poor workmanship to produce a ramp in the profile in the facing direction, that deflects an approaching wheel flange on to the rail head. In extreme situations, the infrastructure may be grossly distorted or even absent; this may arise from earthworks movement (embankment slips and washouts), earthquake and other major terrestrial disruption, deficient protection during work processes etc. Nearly all practical railway systems use wheels fixed to a common axle: the wheels on both sides rotate in unison. Tramcars requiring low floor levels are the exception, but much benefit in vehicle guidance is lost by having unlinked wheels. The benefit of linked wheels derives from the conicity of the wheel treads—the wheel treads are not cylindrical, but conical. On idealised straight track, a wheelset would run centrally, midway between the rails. The example shown here uses a right-curving section of track. The focus is on the left-side wheel, which is more involved with the forces critical to guiding the railcar through the curve. Diagram 2 shows the wheelset displaced to the left, due to curvature of the track or a geometrical irregularity. The left wheel (shown here) is now running on a slightly larger diameter; the right wheel opposite has moved to the left as well, towards the centre of the track, and is running on a slightly smaller diameter. As the two wheels rotate at the same rate, the forward speed of the left wheel is a little faster than the forward speed of the right wheel. This causes the wheelset to curve to the right, correcting the displacement. This takes place without flange contact; the wheelsets steer themselves on moderate curves without any flange contact. This sliding requires a considerable force to make it happen, and the friction force resisting the sliding is designated "L", the lateral force. The wheelset applies a force L outwards to the rails, and the rails apply a force L inwards to the wheels. Note that this is quite independent of "centrifugal force". [note 6] However at higher speeds the centrifugal force is added to the friction force to make L.
The load (vertical force) on the outer wheel is designated V, so that in Diagram 4 the two forces L and V are shown. During this flange contact, the wheel on the high rail is experiencing the lateral force L, towards the outside of the curve. As the wheel rotates, the flange tends to climb up the flange angle. It is held down by the vertical load on the wheel V, so that if L/V exceeds the trigonometrical tangent of the flange contact angle, climbing will take place. The wheel flange will climb to the rail head where there is no lateral resistance in rolling movement, and a flange climbing derailment usually takes place. In Diagram 5 the flange contact angle is quite steep, and flange climbing is unlikely. However, if the rail head is side-worn (side-cut) or the flange is worn, as shown in Diagram 6 the contact angle is much flatter and flange climbing is more likely. Once the wheel flange has completely climbed onto the rail head, there is no lateral restraint, and the wheelset is likely to follow the yaw angle, resulting in the wheel dropping outside the rail. An L/V ratio greater than 0.6 is considered to be hazardous. It is emphasised that this is a much simplified description of the physics; complicating factors are creep, actual wheel and rail profiles, dynamic effects, stiffness of longitudinal restraint at axleboxes, and the lateral component of longitudinal (traction and braking) forces. Following a derailment, it is naturally necessary to replace the vehicle on the track. If there is no significant track damage that may be all that is needed. However, when trains in normal running derail at speed, a considerable length of track may be damaged or destroyed; far worse secondary damage may be caused if a bridge is encountered. With simple wagon derailments where the final position is close to the proper track location, it is usually possible to pull the derailed wheelsets back on to the track using rerailing ramps; these are metal blocks designed to fit over the rails and to provide a rising path back to the track. A locomotive is usually used to pull the wagon. If the derailed vehicle is further from the track, or its configuration (such as a high centre of gravity or a very short wheelbase) make the use of ramps impossible, jacks may be used. In its crudest form, the process involves lifting the vehicle frame and then allowing it to fall off the jack towards the track. This may need to be repeated. A more sophisticated process involves a controlled process using slewing jacks in addition. Photographs of early locomotives often indicate one or more jacks carried on the frame of the locomotive for the purpose, presumed to be a frequent occurrence. When more complex rerailing work is needed, various combinations of cable and pulley systems may be used, or the use of one or more rail-borne cranes to lift a locomotive bodily. In special cases road cranes are used, as these have greater lifting and reach capacity, if road access to the site is feasible. In extreme circumstances, a derailed vehicle in an awkward location may be scrapped and cut up on site, or simply abandoned as non-salvageable. Note: there is a large list of railway accidents in general at Lists of rail accidents. In the Hatfield rail crash in England in 2000, which killed four people, rolling contact fatigue had resulted in multiple gauge corner cracking in the surface; 300 such cracks were subsequently found at the site. The rail cracked under a high speed passenger train, which derailed. In the earlier Hither Green rail crash, a triangular segment of rail at a joint became displaced, and lodged in the joint; it derailed a passenger train and 49 persons died. Poor maintenance on an intensively operated section of route was the cause. In the Eschede train disaster in Germany, a high speed passenger train derailed in 1998, killing 101 people. The primary cause was the fracture from metal fatigue of a wheel tyre; the train failed to negotiate two sets of points and struck the pier of an overbridge. It was the most serious railway accident in Germany, and also the most serious on any high speed (over 200 kilometres per hour (120 mph)) line. Ultrasonic testing had failed to reveal the incipient fracture. the effect of discontinuities in the cwr track such as points etc. extraneous factors such as formation subsidence. In the Connington South rail crash on 5 March 1967 in England, a signaller moved the points immediately in front of an approaching train. Mechanical signalling was in force at the location, and it was believed that he improperly replaced the signal protecting the points to danger just as the locomotive passed it. This released the locking on the points and he moved them to lead to a loop line with a low speed restriction. The train, travelling at 75 miles per hour (121 km/h), was unable to negotiate the points in that position and five persons died. A passenger train was derailed in the Polmont rail accident in the UK in 1984 upon hitting a cow at speed; the train formation had the locomotive at the rear (propelling) with a light driving-trailer vehicle leading. The cow had strayed on to the line from adjacent agricultural land, due to deficient fencing. 13 persons died in the resulting derailment. However this was thought to be the first occurrence from this cause (in the UK) since 1948. The Salisbury rail crash took place on 1 July 1906; a first class only special boat train from Stonehousepool, Plymouth England, ran through Salisbury station at about 60 miles per hour (97 km/h); there was a sharp curve of ten chains (660 feet, 200 m) radius and a speed restriction to 30 miles per hour (48 km/h). The locomotive overturned bodily and struck the vehicles of a milk train on the adjacent line. 28 people were killed. The driver was sober and normally reliable, but had not driven a non-stopping train through Salisbury before. ^ On Network Rail, so excluding certain "Metro" networks. ^ The high rail is considered to be the outer rail in a curve; the low rail is the inner rail. ^ Yaw describes the situation when the longitudinal axis of the wheelset is not the same as the longitudinal axis of motion. ^ Centrifugal force is a convenient imaginary concept; strictly speaking it is the inertia of a body being accelerated, equal to the product of the mass of the body and the acceleration. ^ The value of L is determined by the load on both wheels of the wheelset multiplied by the coefficient of friction, plus the centrifugal force. But the sliding on the wheel on the low rail is not lateral -- the wheel tread is actually sliding backwards (i.e rotating less rapidly than the forward speed requires) and the lateral friction force generated is limited by the vector of the sliding action. ^ Volo, James M. (2016). Railroad Raiders of the Civil War. Charleston, SC: CreateSpace. p. 26-27. ^ Don DeNevi and Bob Hall, United States Military Railway Service America's Soldier Railroaders in WWII, 1992, Boston Mills Press, Erin, Ontario, ISBN 1-55046-021-8. Iwnicki, Simon, ed. (2006). Handbook of Railway Vehicle Dynamics. Boca Raton, Fl: Taylor and Francis. ISBN 978-0-8493-3321-7. This page was last edited on 10 March 2019, at 08:13 (UTC).